Bird was born in West Baden Springs, Indiana, to Georgia (née Kerns) and Claude Joseph "Joe" Bird, a veteran of the Korean War. He was raised in nearby French Lick, where his mother worked two jobs to support Larry and his five siblings. Bird has said that being poor as a child still motivates him "to this day". Georgia and Joe divorced when Larry was in high school, and Joe committed suicide about a year later. Larry used basketball as an escape from his family troubles, starring for Springs Valley High School and averaging 31 points, 21 rebounds, and 4 assists as a senior on his way to becoming the school's all-time scoring leader. Bird received a scholarship to play college basketball for the Indiana University Hoosiers in 1974. After less than a month on campus he dropped out of school, finding the adjustment between his small hometown and the large student population of Bloomington to be overwhelming. He returned to French Lick, enrolling at Northwood Institute (now Northwood University) in nearby West Baden, and working municipal jobs for a year before enrolling at Indiana State University in Terre Haute in 1975. He had a successful three-year career with the Sycamores, helping them reach the NCAA tournament for the first time in school history with a 33-0 record where they played the 1979 championship game against Michigan State. Indiana State lost the game 75–64, with Bird scoring 19 points but making only 7 of 21 shots. The game achieved the highest ever television rating for a college basketball game, in large part because of the matchup between Bird and Spartans' point guard Earvin "Magic" Johnson, a rivalry that lasted throughout their professional careers. Despite failing to win the championship, Bird earned numerous year-end awards and honors for his outstanding play, including the Naismith College Player of the Year Award. For his college career, he averaged 30.3 points, 13.3 rebounds, and 4.6 assists per game, leading the Sycamores to an 81–13 record during his tenure. Bird also appeared in one game for the baseball team, going 1-for-2 with 2 RBI. Bird was selected by the Boston Celtics with the sixth overall pick in the 1978 NBA draft. He did not sign with the Celtics immediately; instead, he played out his final season at Indiana State and led the Sycamores to the NCAA title game. Red Auerbach publicly stated that he would not pay Bird more than any Celtic on the current roster, but Bird's agent bluntly told Red that Bird would reject any sub-market offers and simply enter the 1979 NBA Draft instead, where Boston's rights would expire the second the draft began and Bird would have been the likely top pick. After protracted negotiations, Bird inked a five-year, $3.25 million contract with the team, making him the highest paid rookie in league history at the time. Shortly afterwards, NBA draft eligibility rules were changed to prevent teams from drafting players before they were ready to sign, a rule known as the Bird Collegiate Rule. In his rookie season (1979-1980), Bird immediately transformed the Celtics into a title contender. The team improved its win total by 32 games from the year before he was drafted and finished first in the Eastern Conference. With averages of 21.3 points, 10.4 rebounds, 4.5 assists, and 1.7 steals per game for the season, he was selected to the All-Star Team and named Rookie of the Year. In the Conference Finals, Boston was eliminated by the Philadelphia 76ers. Before the 1980–81 season, the Celtics selected forward Kevin McHale in the draft and acquired center Robert Parish from the Golden State Warriors, forming a Hall of Fame trio for years to come; the frontcourt of Bird, McHale, and Parish is regarded as one of the greatest frontcourts in NBA history. Behind Bird's leadership and Boston's upgraded roster, the Celtics again advanced to the Conference Finals for a rematch with the 76ers. Boston fell behind 3–1 to start the series but won the next three games to advance to the Finals against the Houston Rockets, winning in six games and earning Bird his first championship. He averaged 21.9 points, 14 rebounds, 6.1 assists, and 2.3 steals per game for the postseason and 15.3 points, 15.3 rebounds, and 7 assists per game for the Finals but lost out on the Finals MVP Award to teammate Cedric Maxwell. At the 1982 All-Star Game, Bird scored 19 points en route to winning the All-Star Game MVP Award. At the conclusion of the season, he earned his first All-Defensive Team selection. He eventually finished runner-up in Most Valuable Player Award voting to Moses Malone. In the Conference Finals, the Celtics faced the 76ers for the third consecutive year, losing in seven games. Boston's misfortunes continued into the next season, with Bird again finishing second in MVP voting to Malone and the team losing in the Conference Semifinals to the Milwaukee Bucks. Bird was named MVP of the 1983–84 season with averages of 24.2 points, 10.1 rebounds, 6.6 assists, and 1.8 steals per game. In the playoffs, the Celtics avenged their loss from the year before to the Bucks, winning in five games in the Conference Finals to advance to the Finals against the Los Angeles Lakers. In Game Four, the Lakers—led by Bird's college rival Magic Johnson—were on the verge of taking a commanding 3-1 series lead before a flagrant foul was committed on Kurt Rambis that resulted in a brawl and caused the Lakers to lose their composure. Boston came back to win the game, eventually winning the series in seven. Bird was named Finals MVP behind 27.4 points, 14 rebounds, and 3.6 assists per game. On March 12 of the 1984–85 season, Bird scored a career-high and franchise record 60 points in a game against the Atlanta Hawks. The performance came just nine days after Kevin McHale set the previous Celtics record for points in a game with 56. At the conclusion of the year, Bird was named MVP for the second consecutive season behind averages of 28.7 points, 10.5 rebounds, and 6.6 assists per game. Boston advanced through the playoffs to earn a rematch with the Lakers, this time losing in six games. In the summer of 1985, Larry injured his back shoveling crushed rock to create a driveway at his mother's house. At least partially as a result of this, he experienced back problems for the remainder of his career. Before the start of the 1985–86 season, the Celtics made a daring trade for Bill Walton, an All-Star center with a history of injury. The risk paid off; Walton's acquisition helped Boston win a league best 67 games. One of Bird's career highlights occurred at the 1986 NBA All-Star Weekend when he walked into the locker room at the inaugural Three-Point Shootout and asked who was going to finish second before winning the shootout. With averages of 25.8 points, 9.8 rebounds, and 6.8 assists, and 2 steals per game, Bird became just the third player in NBA history to win three consecutive MVP Awards. In the playoffs, the Celtics lost only one game through the first three rounds en route to a match-up against the Rockets in the Finals. Bird averaged 24 points, 9.7 rebounds, and 9.5 assists per game for the championship round, leading Boston to victory in six games. The '86 Celtics are commonly ranked as one of the greatest basketball teams of all-time, with the Boston Globe's Peter May and Grantland's Bill Simmons listing them at number one. In 1987, the Celtics made their last Finals appearance of Bird's career, fighting through difficult series against the Milwaukee Bucks and Detroit Pistons. In Game 5 of the Eastern Conference Finals against the Pistons, with five seconds remaining in the fourth quarter and Boston trailing the Pistons 107–106, Bird stole an inbounds pass. Falling out of bounds, Bird turned and passed the ball to teammate Dennis Johnson, who converted a game-winning 2-point layup with less than a second left. The dramatic play saved the series for the Celtics. When they reached the NBA Finals, the Celtics--hampered by devastating injuries--lost to a dominant Lakers team which had won 65 games during the season. The Celtics ended up losing to the Lakers in six games, with Bird averaging 24.2 points on .445 shooting, 10 rebounds and 5.5 assists per game in the championship series. The Celtics would fall short in 1988 losing to the Detroit Pistons in 6 games in the Eastern Conference Finals as the Pistons made up from the heartbreak the previous season. Between them, Bird and Johnson captured eight NBA championships during the 1980s, with Magic getting five and Bird three. During the 1980s, either Boston or Los Angeles appeared in every NBA Finals. Throughout the 1980s, contests between the Celtics and the Lakers—both during the regular season and in the Finals—attracted enormous television audiences. The first regular season game between the Celtics and the Lakers in the 1987–88 season proved to be a classic with Magic Johnson banking in an off balance shot from near the three-point line at the buzzer for a 115–114 Lakers win at Boston Garden. The historical rift between the teams, which faced each other several times in championship series of the 1960s, fueled fan interest in the rivalry. Not since Bill Russell squared off against Wilt Chamberlain had professional basketball enjoyed such a marquee matchup. The apparent contrast between the two players and their respective teams seemed scripted for television: Bird, the introverted small-town hero with the blue-collar work ethic, fit perfectly with the throwback, hard-nosed style of the Celtics, while the stylish, gregarious Johnson ran the Lakers' fast-paced Showtime offense amidst the bright lights and celebrities of Los Angeles. A 1980s Converse commercial for its "Weapon" line of basketball shoes (endorsed by both Bird and Johnson) reflected the perceived dichotomy between the two players. In the commercial, Bird is practicing alone on a rural basketball court (in reality the court was one Bird had had made on the property in French Lick that he had purchased for his mother), when Johnson pulls up in a sleek limousine and challenges him to a one-on-one match. In the summer of 1992, Bird joined Magic Johnson, Michael Jordan and other NBA stars to play for the United States basketball team in that year's Olympics in Barcelona, Spain. It was the first time in the United States' Olympic history that the country sent professional basketball players to compete. The "Dream Team" won the men's basketball gold medal. The Naismith Memorial Basketball Hall of Fame called the team "the greatest collection of basketball talent on the planet". Bird was voted to the NBA's 50th Anniversary All-Time Team in 1996, was inducted into the Naismith Memorial Basketball Hall of Fame in 1998, and was inducted into the Hall of Fame again in 2010 as a member of the "Dream Team". In 1999, Bird ranked No. 30 on ESPN SportsCentury's list of 50 Greatest Athletes of the 20th century. He played both the small forward and power forward positions. Bird has been described as one of the greatest basketball players and greatest shooters of all time. He was selected to 12 NBA All-Star teams. Bird won three NBA championships (in 1981, 1984, and 1986) with the Celtics and won two NBA Finals MVP Awards. Bird won three consecutive regular-season MVP awards; as of 2016, the only other players to accomplish this feat are Bill Russell and Wilt Chamberlain. Bird is also remembered as one of the foremost clutch performers in the history of the NBA; he was known for his excellent play in high-stakes, high-pressure situations. Bird scored 24.3 points per game in his career on a .496 field goal percentage, an .886 free throw percentage, and a 37.6 percentage on three-point shots. Bird had an average of 10.0 rebounds per game for his career and 6.3 assists. Bird was the first player in NBA history to shoot 50% or better on field goals, 40% on three-pointers, and 90% on free-throws in a single NBA season while achieving the league minimum for makes in each category. He accomplished this feat twice. Bird won NBA three-point-shooting contests in three consecutive years. He sometimes practiced shooting three-point shots with his eyes closed. Bird is also remembered as an excellent passer and defender. While he was relatively slow, Bird displayed a knack for anticipating the moves of his opponent, making him a strong team defender. He had 1,556 career steals. In recognition of his defensive abilities, Bird was named to three All-Defensive Second Teams. Bird was widely considered one of Red Auerbach's favorite players. He considered Bird to be the greatest basketball player of all time. Bird's humble roots were the source of his most frequently used moniker, "The Hick from French Lick". Bird was also referred to as "The Great White Hope" and "Larry Legend". Bird was known for his trash-talking on the court. The Celtics employed Bird as a special assistant in the team's front office from 1992 until 1997. In 1997, Bird accepted the position of coach of the Indiana Pacers and said he would be on the job for no more than three years. Despite having no previous coaching experience, Bird led the Pacers to a 58–24 record—the franchise's best as an NBA team at the time—in the 1997–98 season, and pushed the Chicago Bulls to seven games in the Eastern Conference Finals. He was named the NBA Coach of the Year for his efforts. Bird then led the Pacers to consecutive Central Division titles in 1999 and 2000 and a berth in the 2000 NBA Finals. Bird resigned his head coaching position shortly after the end of the 2000 season, following through on his initial promise to coach for only three years. In 2003, Bird was hired as the Pacers' President of Basketball Operations. After the 2011–2012 NBA season, Bird was named NBA Executive of the Year, becoming the only man in NBA history to win the NBA MVP, Coach of the Year and Executive of the Year. On June 27, 2012, a day before the 2012 NBA draft, Bird and the Pacers announced that they would be parting ways; Bird said that health issues were among the reasons for his departure. Bird returned to the Pacers as president of basketball operations in 2013. He stepped down again in 2017, but stayed with the team in an advisory capacity. Bird has appeared in three movies, each time playing himself: Blue Chips, released in 1994 by Paramount; the Warner Brothers film Space Jam with Michael Jordan and Bill Murray, in 1996; and Celtic Pride with Dan Aykroyd, Daniel Stern, and Damon Wayans, which was also released in 1996. Bird's likeness has appeared in several video games. In One on One: Dr. J vs. Larry Bird, Bird plays opposite Julius Erving in a game of one-on-one. A sequel, Jordan vs Bird: One on One, was a 1988 basketball video game. In 2011, Bird was featured on the cover of NBA 2K12, alongside Magic Johnson and Michael Jordan. Bird is also a playable character in the revamped NBA Jam. The band Dispatch has a song called "Just Like Larry" about Larry Bird, who is their hometown hero from his days as a member of the Boston Celtics. Larry Bird and Magic Johnson wrote a book together (with Jackie MacMullan) titled When The Game Was Ours. In a commercial during Super Bowl XLIV, Dwight Howard and LeBron James challenge each other at trick shots for a McDonald's lunch. After they finish, clapping is heard, then the camera pans to the crowd and Bird says "Great show, guys. Thanks for lunch." Howard and James share a confused look. Howard asks, "Who was that?" James replies, "I have no idea." This refers to a McDonald's commercial from 1991 in which Bird and Michael Jordan have a trick shot contest, in which the winner got the lunch and the loser had to watch the winner eat. In October 2005, a man in Oklahoma City, Eric James Torpy, was convicted of shooting with intent to kill and robbery. He asked that his sentence be changed from 30 years' imprisonment to 33 so that it would match Bird's jersey number. His request was granted. Twitter's logo is named Larry in honor of Larry Bird. One of the lead characters in the television series The Neighbors is an alien named Larry Bird, played by Simon Templeman. Bird married Dinah Mattingly in 1989. They have two adopted children, Conner and Mariah. Bird also has a biological daughter, Corrie, from his first marriage to high school classmate Janet Condra. He has four brothers, Mike, Mark, Jeff, and Eddie, and a sister, Linda. Eddie also played basketball at Indiana State from 1986 to 1990 and today is the city park superintendent at Terre Haute. ^ "Sports Essentials". USA Today. Archived from the original on March 8, 2016. ^ a b "Bird Returns | The Official Site Of The Indiana Pacers". Nba.com. June 26, 2013. Retrieved May 13, 2015. ^ "Pacers' Bird named NBA's top exec". CNN Sports Illustrated. May 16, 2012. Archived from the original on May 19, 2012. Indiana Pacers president Larry Bird was voted the NBA's Executive of the Year on Wednesday, becoming the first person to win that award, plus the MVP and Coach of the Year honors. ^ a b c d Schwartz, Larry. "Plain and simple, Bird one of the best". ESPN. Retrieved July 29, 2013. ^ a b Schwartz, Larry. "Eye for victory". ESPN. Retrieved July 29, 2013. ^ a b "Larry Bird: Biography". Retrieved June 28, 2013. ^ "Throwback Thursday: Celtics Draft Larry Bird Sixth Overall". Boston Magazine. Retrieved December 31, 2015. ^ Professor Parquet (January 7, 2015). "The story of how rookie phenom Larry Bird led the NBA's greatest turnaround season – CelticsBlog". CelticsBlog. Retrieved December 31, 2015. ^ a b Magic & Bird: A Courtship of Rivals. HBO, 2010. ^ a b c "Larry Bird Bio". NBA Encyclopedia. Retrieved July 29, 2013. ^ a b c d e f g h i "Larry Bird NBA Stats". Basketball-Reference.com. Retrieved May 13, 2015. ^ Dana Hunsinger (May 4, 2015). "Larry Bird's baseball career: A lofty .500 batting average". Indystar.com. Indianapolis Star. Retrieved December 8, 2016. ^ a b May, Peter (2007) . The Big Three. New York: Simon and Schuster. p. 57. ISBN 978-1-4165-5207-9. OCLC 86221987. Retrieved March 21, 2013. ^ "1978–79 NBA Season Summary". Basketball Reference. Retrieved March 2, 2014. ^ a b "1979–80 NBA Season Summary". Basketball Reference. Retrieved March 2, 2014. ^ "Kevin McHale NBA & ABA Stats". Basketball Reference. Retrieved March 2, 2014. ^ "Robert Parish NBA & ABA Stats". Basketball Reference. Retrieved March 2, 2014. ^ Jun 30, foxsports; ET, 2017 at 10:28p (October 13, 2016). "5 best players in Boston Celtics history". FOX Sports. Retrieved March 29, 2019. ^ "Legends profile: Kevin McHale". NBA.com. Retrieved March 29, 2019. ^ "NBA expert panel: Warriors not the greatest of all time, or even No. 2". Mercurynews.com. June 13, 2017. Retrieved March 29, 2019. ^ a b "1980–81 NBA Season Summary". Basketball Reference. Retrieved March 2, 2014. ^ "1981 NBA Eastern Conference Finals". Basketball Reference. Retrieved March 2, 2014. ^ "1981 NBA Finals". Basketball Reference. Retrieved March 2, 2014. 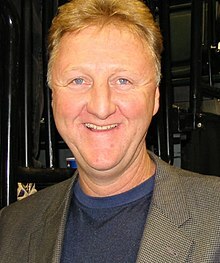 ^ a b c "NBA.com: Larry Bird Bio". NBA.com. Retrieved March 8, 2014. ^ "1982 NBA Playoffs Summary". Basketball Reference. Retrieved March 8, 2014. ^ "1983 NBA Playoffs Summary". Basketball Reference. Retrieved March 8, 2014. ^ a b c "1984 NBA Playoffs Summary". Basketball Reference. Retrieved March 20, 2014. ^ MacMullan, Jackie (2009). When the Game Was Ours. Mariner. p. 136. ISBN 978-0-547-39458-9. ^ Schwartz, Larry. "Eye for victory". ESPN. Retrieved March 29, 2014. ^ MacMullan, Jackie (2009). When the Game Was Ours. Mariner. p. 15. ISBN 978-0-547-39458-9. ^ "1985 NBA Finals Composite Box Score". Basketballreference.com. Retrieved December 31, 2015. ^ a b "1985–86 Boston Celtics". NBA.com. Retrieved March 30, 2014. ^ "1985–86 NBA Season Summary". Basketball Reference. Retrieved March 30, 2014. ^ Caplan, Jeff (February 5, 2010). "With Bird in, good things came with 3s". ESPN. Retrieved June 15, 2014. ^ "Relive the Moment: Larry Bird Easily Wins Inaugural 3-Point Contest After Asking Field Who Would Finish Second". New England Sports Network. August 17, 2011. Retrieved June 15, 2014. ^ "Larry Legend – Bird wins third straight MVP". ESPN Classic. Retrieved March 30, 2014. ^ "1986 NBA Finals Composite Box Score". Basketballreference.com. Retrieved December 31, 2015. ^ Poulard, JM. "The 1985–86 Boston Celtics". Warriors World. Archived from the original on April 14, 2014. Retrieved April 13, 2014. ^ "1987 NBA Finals Composite Box Score". Basketballreference.com. Retrieved December 31, 2015. ^ Staff, NBA.com. "NBA Season Recaps: 1946-2018 | NBA.com". NBA.com. Retrieved November 24, 2018. ^ "Celtics-Lakers Box Score". Basketballreference.com. ^ "The Naismith Memorial Basketball Hall of Fame - Hall of Famers". August 18, 2010. Retrieved December 2, 2018. ^ ET, 2016 at 8:28a. "10 reasons we still love Larry Bird on his 60th birthday". FOX Sports. Retrieved March 29, 2019. ^ "Larry Bird Summary". NBA.com. Retrieved May 13, 2015. ^ Wise, Mike (October 3, 1998). "PRO BASKETBALL; A Bashful Larry Bird Joins Hall Of Fame". Nytimes.com. Retrieved March 29, 2019. ^ "The Naismith Memorial Basketball Hall of Fame – Hall of Famers". Hoophall.com. December 7, 1956. Archived from the original on August 29, 2009. Retrieved May 13, 2015. ^ "1992 Dream Team Inducted into Hall of Fame". Cbsnews.com. Retrieved March 29, 2019. ^ a b c "Larry Bird". Biography.com. Retrieved March 29, 2019. ^ "Classic NBA Quotes". NBA. Retrieved September 12, 2009. ^ a b c "Legends profile: Larry Bird". NBA.com. Retrieved March 29, 2019. ^ "Who's The Best Small Forward Of All Time: Larry Bird Or LeBron James?". Boston.cbslocal.com. June 22, 2016. Retrieved March 29, 2019. ^ Fromal, Adam. "LeBron James: Michael Jordan, Larry Bird, Julius Erving Are 3 Best Players Ever". Bleacher Report. Retrieved March 29, 2019. ^ Feb 15, FOX Sports Southwest; ET, 2019 at 11:59a. "Who Has Made The Most NBA All-Star Game Appearances of All-Time". FOX Sports. Retrieved March 29, 2019. ^ Library, C. N. N. "Larry Bird Fast Facts". CNN. Retrieved March 29, 2019. ^ "NBA MVP award: Steph Curry on list of multiple-time winners". Azcentral.com. Retrieved March 29, 2019. ^ News, ABS-CBN. "Who is the most clutch player in NBA history?". ABS-CBN News. Retrieved March 29, 2019. ^ Goss, Nicholas. "Kobe Bryant, Larry Bird, Michael Jordan, and the 10 Best Closers in NBA History". Bleacher Report. Retrieved March 29, 2019. ^ "Ranking 10 Most Clutch Players in NBA History". Orlando Magic. Retrieved March 29, 2019. ^ a b "NBA.com: Larry Bird Summary". Nba.com. Retrieved March 29, 2019. ^ "The 50-40-90 Club Could Be Expanding". OpenCourt-Basketball. January 2, 2018. Retrieved March 29, 2019. ^ Jan 22, FOX Sports Wisconsin; ET, 2019 at 4:03p (January 22, 2019). "StaTuesday: Bucks' Malcolm Brogdon on pace for rare 50-40-90 season". FOX Sports. Retrieved March 29, 2019. ^ Parquet, Professor (October 30, 2014). "How Larry Bird won the first 3 All-Star shootouts". CelticsBlog.com. Retrieved March 29, 2019. ^ Greenberg, Chris (December 15, 2017). "Professor LeBron delivered a history lesson on Larry Bird's legendary game". SBNation.com. Retrieved March 29, 2019. ^ "Career Leaders and Records for Steals". Basketball-reference.com. Retrieved July 11, 2010. ^ "CNN.com". Sports Illustrated. April 6, 1979. Retrieved July 11, 2010. ^ "Wayback Machine". Web.archive.org. Retrieved March 29, 2019. 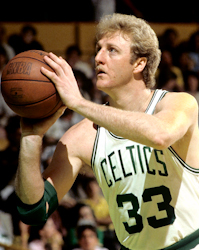 ^ "Larry Bird in photos: The 'Hick from French Lick' becomes Celtics legend". Sporting News. Retrieved March 29, 2019. ^ "NBA.com: Larry Bird Summary". Retrieved June 3, 2009. ^ "Talking the talk: An '86 Celtics trash-talking tale". NBC Sports Boston. January 20, 2016. Retrieved March 29, 2019. ^ "Kevin McHale shares a classic Larry Bird trash talk story". Ftw.usatoday.com. May 1, 2018. Retrieved March 29, 2019. ^ "Larry Bird hangs it up". History.com. Retrieved March 29, 2019. ^ Berkow, Ira (August 10, 1997). "Bird Shoots for Coaching Greatness With the Pacers". Nytimes.com. Retrieved March 29, 2019. ^ Writer, Malcolm Moran, Tribune Staff. "AFTER THE NBA FINALS, LARRY BIRD WILL QUIT AS INDIANA'S COACH. HIS COMPETITIVENESS HAS TAKEN ITS TOLL. BUT DON'T BET THAT HE WON'T BE BACK". Chicagotribune.com. Retrieved March 29, 2019. ^ a b c "Year by Year with the Pacers". Indiana Pacers. Retrieved March 29, 2019. ^ "Larry Bird stepping down from Pacers post". ESPN.com. April 28, 2017. Retrieved March 29, 2019. ^ MAROT, MICHAEL (May 1, 2017). "For 2nd time, Hall-of-Famer Bird resigns as Pacers president". VIRGINIAFIRST.com. Retrieved March 29, 2019. ^ "Larry Bird resigns as Pacers president, Kevin Pritchard to take over". USA TODAY. Retrieved March 29, 2019. ^ "Pacers' Larry Bird is NBA Executive of the Year - Yahoo! Sports". Web.archive.org. July 12, 2012. Retrieved March 29, 2019. ^ "Indiana Pacers part ways with Larry Bird". CBS/AP. Retrieved June 27, 2012. ^ "Bird Steps Down; Pritchard Named President of Basketball Operations". NBA.com. May 1, 2017. Retrieved May 2, 2017. ^ "Larry Bird". IMDb.com. Retrieved May 13, 2015. ^ "Your NBA Jam Rosters Are Set". Kotaku.com. Retrieved May 13, 2015. ^ "lyrics | Dispatch – Just Like Larry". SongMeanings. Retrieved July 11, 2010. ^ Sheinin, Dave (December 13, 2009). "Book review: When the Game Was Ours by Larry Bird and Magic Johnson". The Washington Post. Retrieved December 23, 2015. ^ "FULL VERSION: McDonald's Commercial with LeBron James and Dwight Howard". YouTube. Retrieved April 16, 2011. ^ "Felon gets longer sentence to match Bird jersey". Sports.espn.go.com. Retrieved May 13, 2015. ^ "Simon Templeman as Larry Bird – The Neighbors Characters & Cast Bios – ABC.com". ABC. November 2012. Archived from the original on May 10, 2013. ^ "Larry Bird Biography – ESPN". Espn.go.com. December 7, 1956. Retrieved May 13, 2015. May, Peter (2007) . The Big Three: Larry Bird, Kevin McHale, and Robert Parish: The Best Frontcourt in the History of Basketball. New York: Simon and Schuster. ISBN 978-1-4165-5207-9. OCLC 86221987. Retrieved March 21, 2013. 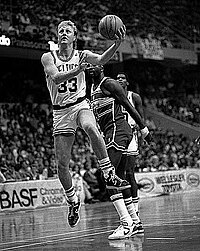 This page is based on the Wikipedia article Larry Bird; it is used under the Creative Commons Attribution-ShareAlike 3.0 Unported License (CC-BY-SA). You may redistribute it, verbatim or modified, providing that you comply with the terms of the CC-BY-SA.